POLL: Will you buy health insurance rather than pay a penalty? If you are one of the more than 200,000 Tennesseans in the market for Obamacare coverage for next year, be ready for sticker shock: Prices at last year's most popular insurer, BlueCross BlueShield of Tennessee, have gone up 36 percent. There's more sticker shock. If you are one of those who didn't bother to sign up last year under the Affordable Care Act because you don't think you need health insurance, you may want to think again this year: the penalty goes up significantly, from $325 to $695 for each adult in the household, or 2.5 percent of your income — whichever is higher. So when this year's exchange opens for business at midnight Saturday, the advice from experts is simple — shop around. Yes, you will need to visit www.healthcare.gov to sign up, but the government's computer experts insist the website is faster and easier to use than before. Whatever else has changed, the complexity of the health-care exchange remains. Consumers will need to choose among dozens of plans, many with apparently only slight differences. But experts say those small differences can make big differences in how much you pay for drugs or a visit to your doctor. In a conference call with reporters Friday afternoon, U.S. Health and Human Services officials said consumers saved an average of $400 last year when they switched plans. Officials estimated that 80 percent of enrollees can find a plan that — with subsidies — will cost $100 a month, and 75 percent of enrollees will find a plan that costs just $75 a month. But the subsidies vary widely depending on age, income and number of children. Search for "Obamacare subsidy calculator" to find several online tools to learn if you are eligible and if so, for how much. Some 80 percent of Tennesseans who signed up for ACA coverage last year did so with BlueCross. The Chattanooga-based insurer raised its rates by an average of 36 percent this year after losing $141 million in the marketplace last year. Federal officials emphasized that the subsidies are based on the rates charged by insurers, so in general, if rates go up, the subsidies should also increase. About 83 percent of all Tennesseans with ACA coverage last year received a subsidy, according to Russ Blakely, president of Russ Blakely and Associates, an employee benefits adviser in Chattanooga. "At least half of those 83 percent won't see anything near 36 percent [premium increases]," he said. "Maybe 5 or 10 percent." Three other insurance companies are in the health-care marketplace for 2016 besides Blue Cross — Cigna, Humana, and UnitedHealthcare, which did not offer plans in Tennessee last year, although it already served Georgia and Alabama. Cigna and Humana did not offer competitive rates last year, but also sought only slight rate increases. They may be more competitive this year. Missing this year is the Community Health Alliance, the consumer-run co-op that said last month it will not offer plans for 2016 due to financial difficulties. 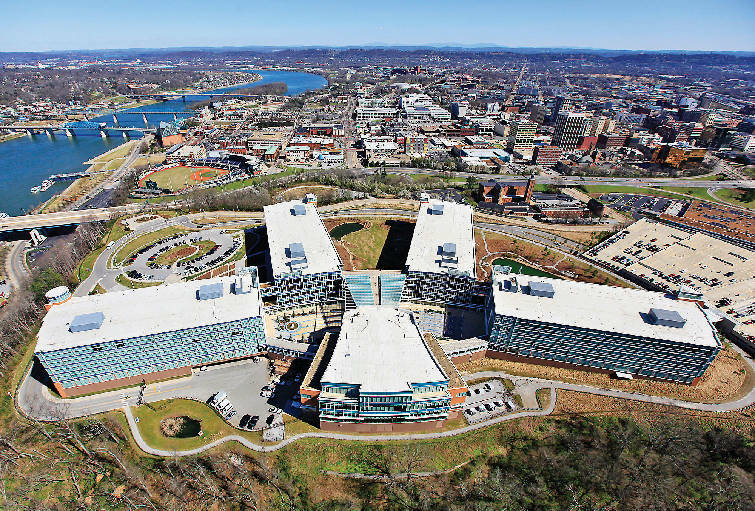 The Chattanooga headquarters of BlueCross BlueShield of Tennessee is shown in an aerial view. Experts have a laundry list of what to consider before buying. One is the monthly premium, or how much you will pay before any subsidy. They vary widely, from around $450 to more than $1,200, depending on what is covered and the amount of the deductible or co-payment. First, figure out how much you spent on health care this year and what you think you'll spend next year. Remember to look at the bill from the doctor or test center or hospital, not what you actually paid after health insurance kicked in. Add up the bills for visits to your primary-care doctor. Add in what you spent for drugs. Then find those bills for blood tests or MRIs or X-rays. Did you make a trip to the emergency room? Do you need to see a specialist for a particular medical condition? If your bills were low and you don't have any recurring medical problem, you can probably stick to the lowest or "bronze" level of coverage. "A lot of our members are buying silver plans, where co-insurance comes into play, and the tax credit covers part of that premium," said Carla Raynor, vice president for strategic marketing at BCBS. People going for the more expensive gold and platinum plans are "the heavy utilizers, people who are living with a chronic condition, and for whom managing health insurance is definitely a priority," she said. Signing up typically takes between 60 and 90 minutes, according to UnitedHealthCare spokeswoman Tracey Lempner. Have Social Security numbers for all family members; proof of legal residency, such as a driver's license; employment and income information (recent tax returns and pay stubs); policy numbers for any current health insurance, and information about any employer-provided insurance that may be available to your family. Here are some of the 2016 offerings from BlueCross BlueShield. Plans from United, Cygna and Humana should be similar, although details will vary. The exact number of BCBS plans depends on who you are and where you live. For a 59-year-old in the Chattanooga metropolitan area, BlueCross offers more than 50 plans: 12 at the bronze level, 26 silver, 12 gold and six platinum. The cheapest bronze plan costs $5,448 annually versus $17,448 for the highest platinum plan — a difference of $12,000. But that cheapest plan has a $5,200 deductible, versus a zero deductible for the more expensive one. The co-pay for the budget plan is 50 percent of treatment costs. The expensive plan has a $3 co-pay for generic drugs, $40 for a visit to a specialist, $10 for visiting your primary care doctor, and it pays all but 25 percent of an emergency room visit. If you take a lot of expensive drugs or need regular visits to a specialist, the plan with the higher premium may turn out to be cheaper. Most Americans, some 65 percent if last year is any guide, will end up with a silver plan. That's one reason BlueCross is offering 26 varieties, Raynor said. Those range from $568 to $889 a month, with deductibles from zero to $6,000. There are co-pays of zero, 10, 20, 40 and 50 percent of your bill. Pay particular attention to which doctors are in your network, Raynor advised. If you really like your primary care doctor or any specialists you may see regularly, check to see if they are in the plan's network. On the other hand, if you are willing to switch doctors, you can save some money. If you have no intention of buying health insurance, read this carefully: The penalty for not having health insurance goes up dramatically this year, to $695 for each adult member of a family, plus $347.50 for each child, up to a maximum of $2,085 — or 2.5 percent of your income, whichever is greater. The government will collect that money by deducting it from your tax refund. It is no surprise that, when you add in the subsidy, some of the more affordable plans for middle-income families don't cost much more than the penalty. The government really wants you to sign up for health insurance. "Hopefully over time, this is going to help Americans appreciate that health care is important and a priority," said BlueCross' Raynor. Taking care of your health, "is just as valuable as a cellphone or cable." Contact reporter Steve Johnson at sjohnson@timesfreepress.com, 423-757-6673, on Twitter @steve johnsonTFP or on Facebook at stevejohnsonTFP.